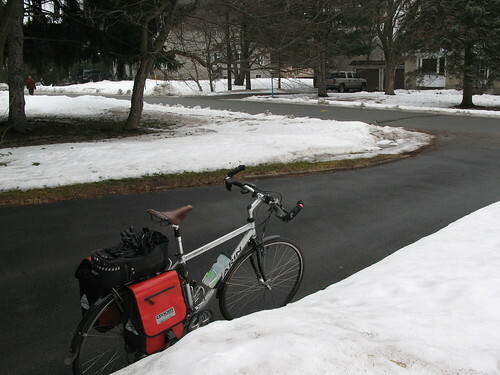 First ride of the season – bliss!! Posted by Kern on March 18th, 2011. Happy St Patrick's Day indeed! I'm going on a bike ride with, er, Patrick tomorrow so I will only celebrate (a day late) with one glass of the black stuff tonight. Well done on getting out, Kern. You make us look like a right bunch of softies Kern! 😀 I'm sat here waiting for it to stop drizzling before I venture out. Fabulous Kern, and its still mighty cold out there for you. We finally reached 10 dgrees C today. HOw much longer for your snow to lie about? Stunning day here, 22nd March. Still, sunny 10C Easterly wind (barely). My favourite weather. Glad to hear it Garry. We are also around 10C, just place a negative sign in front of it (overnight lows). No gulf stream flows this way. My day of bliss was shortlived.